The Berlin Wall has fallen, the Iron Curtain is down, apartheid is over, the cold war has ended. IBM and Apple Computer have collaborated on a project. Merger-mania is sweeping the planet. GATT has passed. Multinational economic trading blocks have formed. China has joined the world economy. Dictatorships are converting to democracies. The world is changing in ways that few had conceived in the past. Change has become the constant. The anxiety of conflicting value systems, as in thesis/antithesis, dominate the headlines. We have reached a point of inflection between two epochs of human evolution. I - The initial stable population with the values endemic to the view of the world that those inhabitants shared. II - A period of change that consists of a time of expansion and a time of reduction characterized by great friction between the old and new value systems. III - The predicted re-stabilization of the human population and the values endemic to the view of the world that those inhabitants will share. Definitions of Dominant Value Systems - Epoch "A" & "B" Those paradigms not self-explanatory from the preceding table are listed below. Period I is characterized by the primary stable population base and the values endemic to that time. 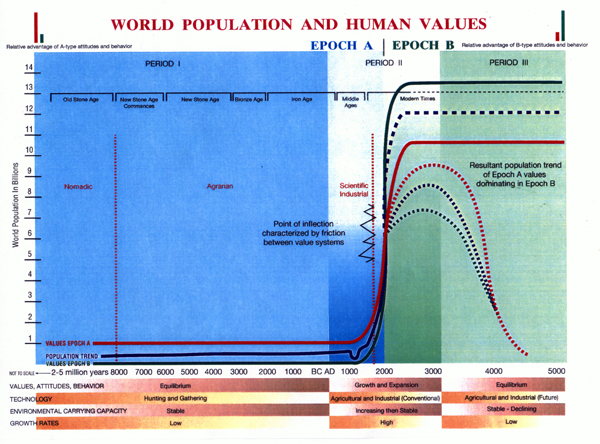 Period II being the transition period between Epoch "A" and "B" consists of two interims characterized by an increasing and a decreasing population trend── and the friction between the value systems associated with each epoch. i.e. the value system of Epoch "A" struggling to maintain its foothold and the value system of epoch "B" struggling to gain its expected dominance as we evolve. Period III is predicted to be characterized by the restabilization of the population base and the values endemic to that time. Certainty: Uncomfortable with chaos being the nature of the universe. Uncertainty: Comfortable with chaos being the nature of the universe. Uncertainty: Uncertain of the future. Certainty: Certain of the future. Expansion: No limits to the extent of expansion. Reduction: Recognition of limits to expansion. Either/Or: (Win/Lose) I win you lose or vice versa. Both/And: (Win/Win-Lose/Lose) We both win, or, we both lose. Meta-physical Value:Psyche valued higher than material. Centric: Self-utilization of resources highly regarded. Non-Centric: Sharing resources highly regarded. Present (short range): Events are viewed with their short range implications. Future (long range): Events are viewed with their long range implications. Interdependence: Utilitarian to act inter-dependently. Systems science looks at the world as interactive processes. These processes occur within systems. A system can be said to have subsystems, or a subsystem can be viewed as a system with its own subsystems. Every living dynamic system is tied in some way to all other systems. What happens at the macro-level effects the micro-level and vice versa, with resonance's equivalent to the relevance of the individual event. Whether it is the human psychological system interacting with the biological system, or the rays of the sun from our solar system interacting with the agricultural system, we must realize the integral association between all these processes. With this in mind we can see that solutions that address the needs of the entire system, including parent and sub-systems, are apt to be more efficient and effective than those that do not. Since all systems are inter-dynamic we can define the forces of nature in any given system in simplistic terms. They are centripetal and centrifugal. Evolution or regression is enabled by outside forces from the parent system influencing the sub­systems, which dynamically interact with each other, in both organized and unorganized processes [Chaos Theory]. The centripetal and centrifugal forces of any given system can be viewed as protectionary and progressive functions. The centripetal force is the protectionary nature of the system to guard itself from outside forces. The centrifugal force is the progressive nature that enables evolution--as the parent system evolves so must its subsystems. These forces can also be considered thesis and antithesis and are the forces that constitute dynamic equilibrium. The concept of dynamic equilibrium is a basic force in nature that keeps systems in some form of balance (nature abhors a vacuum). This balance can be precarious or it can be stable. Sir Isaac Newton gave us, in his laws of motion, the principle theory of "for every action there is an equal and opposite reaction". Healthy systems achieve synthesis or dynamic equilibrium. The forces of thesis and antithesis dynamically opposing each other will either achieve synthesis, dynamic equilibrium, or separation. In the latter case, the separation may lead to the death of the system or the creation of new systems--as in a cell splitting. The importance of a systems approach to solutions on our planet is now more important than ever as the population increase continues to inhibit self serving concerns--forcing survival with the knowledge of the limited resources our biosphere has to offer. The Earth can be viewed as a system with subsystems as well. Its' major functional systems can be seen as mass, liquid and gas breaking down into meteorological, tectonic mass and biochemical. Earth is not a closed system since it relies on the energy from the sun (parent system) to fuel its many processes in order for its biological subsystems to survive. Within the ecosystem of Earth's many biological subsystems is humankind. Humankind is unique in the sense that it has the ability to create new systems--whereas most systems simply react and evolve in accordance with the external influences of their environment. The human system reacts and creates external systems to accommodate its evolution. If we view the planet Earth as one living system then all of the processes that operate within that system can be considered subsystems. As we further define and understand the subsystems of our biosphere we have learned that in some way they are all inter­connected and/or influence each other. The systems of human kind, the government, nations, states, regions, cities, towns, schools, families, and individuals interact and thereby influence each other. If we define the human individual as a system we can then examine the subsystems of the human person. We consist of a biological system, and a psychological system. The psychological systems can be viewed as the sexual-self, the emotional-self and the intellectual-self. The biological systems contain the neurosensory system, the cardio-vascular system, muscular-skeletal system, the respiratory, gastro-intestinal & endocrine systems, et cetera. Scientists at MIT have created a mathematical model known as "Chaos Theory". Within the subset theorems there is what is known as "The Butterfly Effect" which demonstrates that even the flapping of a butterfly's wings can alter the flow of the jetstream within a matter of weeks. The dynamic interaction of events compounds into infinitely more complex patterns becoming increasingly difficult to compute as time progresses after an event is introduced in the universal system. By participation (being within the nucleus of the event). By observation (being in one of many orbits around the event). By explanation (being subject to participant/observer or media). Everything we perceive is experiential. There are two ways to perceive experience - passively and actively; unconsciously whereas the event is trivialized and stored in the collective unconscious, and consciously, whereas its pertinence is deemed substantial and it is mingled with cognitive equative thought. Interpreting the relationship between causes and circumstances which produce an event is an extremely dynamic process. The resultant ramifications and thereby understanding that forms by virtue of the bias of perspective is dictated by the compendium of experience that a particular individual has lived. This bias explains how two persons witnessing the same event can give conflicting testimony regarding the facts of the event (personal reality verses actual truth). This bias also hampers the communication of ideas since the medium of communication is subject to this same complication. Each individual filters and ranks the pertinence of new information in relationship to personal perspective. The collective consciousness is altered by virtue of the experience. This may enhance or degrade the perception of truth. An individual's perception of truth is biased by that persons perspective which produces a personal version of reality that may, or may not, be shared by others. It is impossible to disassociate oneself from ones environment. Therefore we can safely assume that all observation is interpreted by the brain and thereby effects the aggregate contermination of thought. We are affected by even the most minute changes in our experience of our environment.